Here they are Kristina zipped and un-zipped. The darker bag is the version with the zipper. It requires a bit of sewing which I know is not everyone's cup of tea. That's why I decided to make the zipper-less Kristina too! 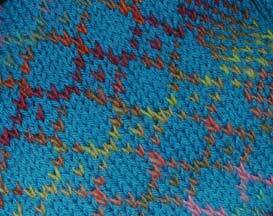 And here's a view of the inside so that you can see how nicely the strands become one with the fabric of the purse. I didn't bother to tack down the strand that was being carried along, I just let it float. When the bag was fellted, these strands smooshed down flat as a pancake! Here's one last photo. I'm hoping that you can see the end pattern a little better in this one. And I always get this question, so I'll answer it in advance -- yes, those bags are standing up all by themselves with nothing in them and nothing supporting them. I credit that to good blocking. 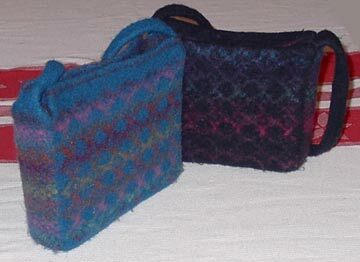 Boss those felted bags around! Kristina will be available at ThreadBear and other fine Knitting shops around the country starting in about 1 1/2 - 2 weeks. I'll post more info as I finish writing up the pattern and send it off to the printer! 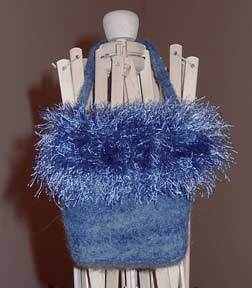 Here is a furry Madeleine Bag before felting and . . .
After! Maddie keeps asking if it's dry yet. Gotta keep her looking her stylish best. I only wish that I had this furry stuff before so I could have added some to the brim of her hat! I just updated Booga J Reads, my reading blog. And a quick update on the Kristina Bag. She made it through the wash and is blocking as we speak. She should be read for a photo shoot in a day or two. Stay tuned! I finally joined The Knitting Guild of America and signed up for the Master Knitter's Program. I've been thinking about doing this for a while now, and I think I'm ready to start. I'm feeling pretty confident about everything I've learned in the last few years, so I thought I'd give it a try. I'd love to hear comments from those of you who are working on the Master Knitter program, or those of you who have completed it! Now I'm getting somewhere. . .
As you can see, I'm plugging away on Liv. 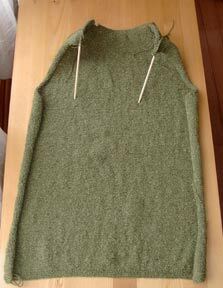 The front is knit in two pieces up to a point, then joined and worked up to the neck shaping. I really enjoyed working on the two front pieces because I finally get to do some of the knotwork! Probably a good thing that I did the back first since it was the most boring of all the pieces in this sweater. I think the Silky Wool really shows off the knots, don't you? Okay, political commentary to follow. Please avert your eyes if you can't deal with it. I won't blame you. After watching Bush on TV last night I'm thoroughly ill and can hardly bring myself to think about it. However, there is an election approaching and I can't bear the thought of having him in office an longer. Check out the point by point evaluation of his "state of the union" (i.e. please re-elect me) speech at the Center for American Progress. It may turn your stomach, but you have to face the facts if you want to change them. Gapers Block published one of my man's photos. Go look at it! Did you hear? There is a new online knitting magazine coming! It's called MagKnits and and it is the creation of Kerrie. 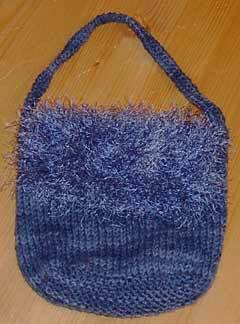 I'm excited to tell you that I will have a felted bag pattern (what else?!?) featured in the new magazine. Stay tuned for more info in the coming weeks! And thanks to everyone who took a look at the new Black Sheep Bags website. I've made even more changes to the site and I'm sure that there will be more changes in the coming weeks. I'm also pleased to announce that I am almost finished with my latest design. 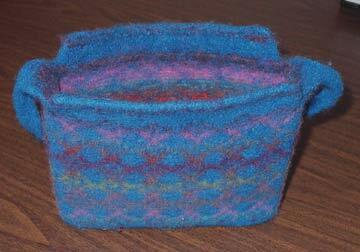 It's going to be a fair-isle type felted bag. More on that soon! I took the plunge and bought a url for Black Sheep Bags. After spending a couple of nights brushing up on CSS I have a working, albeit very simple, website. Now I need your help. If you could please take a look at it and let me know if there is any strangeness happening. I know there are lots of different browsers and operating systems out there and I don't have access to all of them. I thank you in advance!! And if you would like to learn more about CSS (Cascading Style Sheets) you can learn about them too! I have learned almost everything I know about web authoring at Webmonkey. It has tons of great info on HTML, CSS, web graphics, JAVA, & more! There is even a section for beginners. I have spent many hours reading and re-reading these great articles. Whenever I enter a yarn store, I am drawn to any alpaca by some strange force. Just ask Theresa! 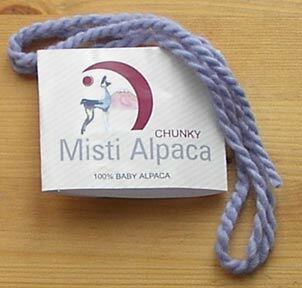 And when I saw this chunky 100% baby alpaca, I had to try it out. This scarf, which is 6 in, wide and 44 in. long, took only one hank of the Misti Alpaca. You get a generous 100g which is 108 yds. for $12.50 (at least where I got it). 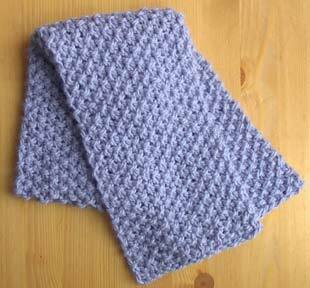 Not a bad price for a super soft scarf! Oh yeah, and I finished the back of Liv this weekend. Don't let that circular needle fool you, it is finished. EL has you doing a three needle bind off for the shoulder seams and I guess you work the neck right off of the stitches on the needle at the end. The instructions for this part seemed odd, but I'm hoping that it will all work out when I get to that part. And I finally decided it was time to buy "www.blacksheepbags.com". You can see the "coming soon" page at www.blacksheepbags.com. I'm still working on the actual website. I decided that I need to really learn CSS before I design it so that making a change to the site isn't a total nightmare. Hopefully I'll have something ready in the next week! Quick Note -- I just updated Booga J Reads. I used to use Mozilla on my laptop and I thought it was great. Then I bought my new desktop and got used to IE. Today I got the urge to try Mozilla again and I downloaded Firebird. All I can say is WOW!! It's free and it even has pop-up blocking software. Try it. The speed is amazing. I'm hoping this will help me to check the ring more quickly. On the knitting front, I am coming close to finishing the back of Liv. My husband saw an article about charity knitting on Gaper's Block. They include a link to a list of charities organized by state which was put together by Wool Works. What a great idea! Winter has finally hit Chicago (yeah, I live in Joliet, but I'm a Chicagoan at heart). Perhaps this is why I have re-caught the knitting bug and am flying along on Liv. 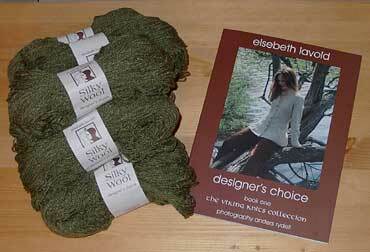 I really do like the Silky Wool and highly recommend it! 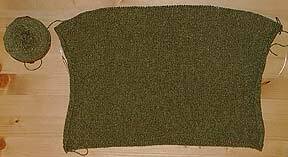 Here is a pretty lousy picture that was supposed to give you an idea of the texture and color variations in the Sily Wool when it's knit up. The sweater is mostly reverse stockinette. And at this point I would like to say a huge "Thank You!!" to Pubah for sending me the corrections to Liv. You have saved me a huge headache and I appreciate it! Liv, Front p.28 An * is missing -- The text for Shape left side of neck, WS should read "*Work 3 sts...". Right side of neck should be worked as the left, reversing all shaping. And I *finally* found Elsebeth Lavold's website. A huge portion is in English and it's rather interesting to browse through. There is even a bit about the Knitting Along the Viking Trail Exhibit. 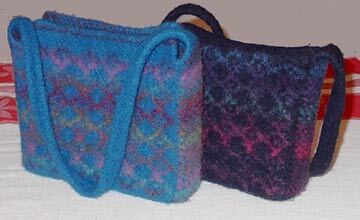 I really liked the feel of the silky wool in the hank and it is knitting up beautifully. I've already got a good start on the back. It helps that we got about 6 in. of snow today. Not much to do except knit. On an unhappy note, I broke one of my Brittany US1 double points while working on Pete's socks. (Are these socks cursed?!?) I hear that Brittany is good about replacing broken needles and I have already sent an email to them. Hopefully they will come through. I really do like their needles and I hope their customer service is of equal quality.